Perhaps I should have been more careful, I knew Louise’s bowels sounded weird. Now the whole bathtub looks like a nightmare. I consider myself lucky I was beside the tub. Nevertheless I didn’t come out undamaged, some of Louise’s mess ended up on my arms. The smell in the bathroom is just terrible and every part of my excitement has vanished completely. I feel betrayed and angry. I try to keep my senses as I use the showerhead to clean myself. I disconnect the showerhead from the hose and turn up the cold water all up. 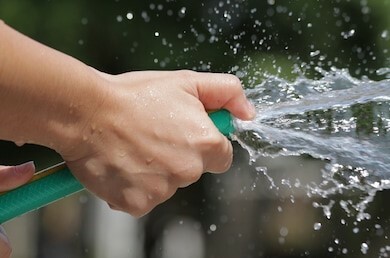 I press down on the tip of the hose so I can get a hard jet of water from it. I point the cold jet of water straight onto Louise’s naked body. And although she isn’t hit by the water Mary jumps out of the tub scared of the cold water. The jet is so strong and cold that Louise’s pale skin turns red where ever I point the jet. Of course she makes attempts to avoid the water but I have enough distance from her to be able to point the jet in any direction she moves to. I am surprised how fast her skin turns red and with the jet I can almost write on her skin. I can’t help enjoying myself cornering Louise with a single stream of water. Just for the fun of it I try to hit her sensitive parts. I just love to hear her squeal like a little piglet.